A celebration of life will take place on April 14th from 1:00 pm to 4:00pm at the Great Falls Senior Center, 1004 Central Avenue. At her request, no funeral services will be held. Cremation has taken place under the care of O’Connor Funeral Home. Interment will be held at a later date in the family plot at Lakeview Cemetery in Valier, Montana. She is survived by daughters Audrey and Sara; as well as her beloved granddaughter Elise; and her cat, Ali; she also leaves three nephews, Mark Thompson, Leigh Johnson, Evan Thompson (Jenna, Natalie, Jude); one niece Deborah Thompson (Amber and Andre); numerous cousins including Ambrose Old Man Chief who checked in with her daily; and many friends including lifelong friend, Myrna Kuka who was like a sister. Helen was preceded in death by her parents Frances and Myron Thompson and brother Thomas Thompson. 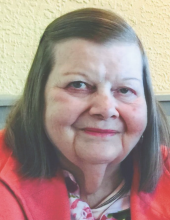 In lieu of flowers, contributions may be made to Benefis Peace Hospice of Great Falls in memory of Helen Thompson to support patient care. To plant a tree in memory of Helen Thompson, please visit our Tribute Store. In lieu of flowers, contributions may be made to Benefis Peace Hospice in memory of Helen to help support patient care. "Email Address" would like to share the life celebration of Helen Thompson. Click on the "link" to go to share a favorite memory or leave a condolence message for the family.